Man, I had an ABSOLUTE blast this past weekend as we opened up our Parenting With Swagg Series talking about the IMPORTANCE of parenting and how we can ensure we are raising our kids in line with the word of God. 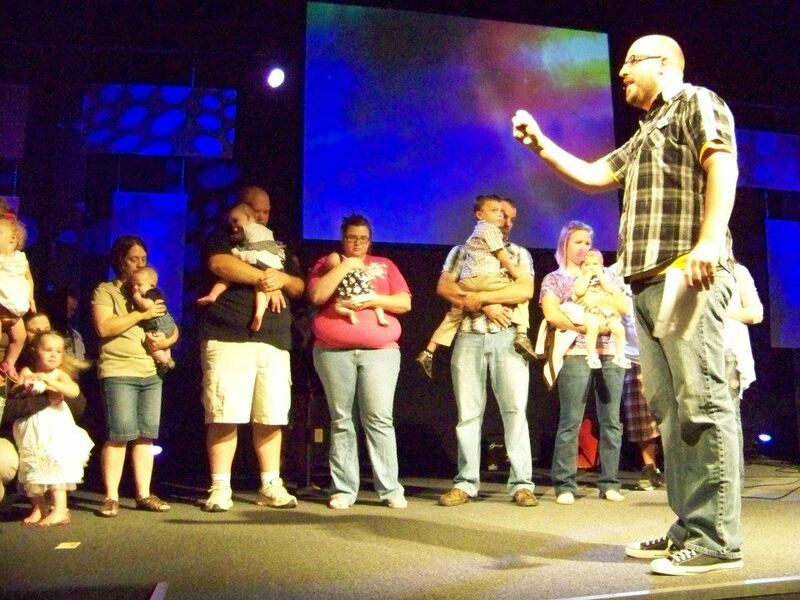 In the 11A service, we ALSO had the PRIVILEGE to dedicate 10 babies to the Lord before we started our talk (pic above). 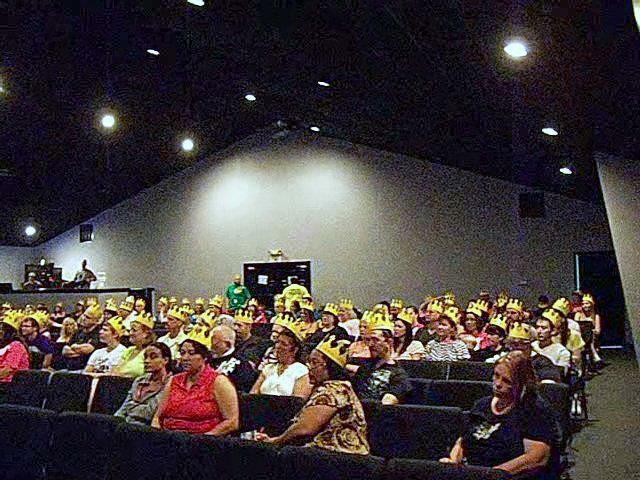 It is literally one of the highlights of my year to see parents stand publicly to let friends and family know that they are CHOOSING to dedicate themselves to provide a BIBLICAL atmosphere for their children to where one day their child will be able to dedicate themselves to God with their own life because of the atmosphere we provided them through our parenting! Proverbs 22:6 says ‘Train up a child in the way he should go, even when he is old, he will not depart from it.’ The word TRAIN in the hebrew means ‘to fully dedicate’. What a place to start as a parent than at the very beginning of our child’s life journey. It was an incredible time of prayer, challenge, and encouragement…and it was SO COOL to be able to show off our new little church members! What’s AMAZING is WHO Jesus called upon to follow Him…a TAX COLLECTOR who worked for the ROMAN GOVERNMENT, are you joking me?! Tax collectors were HATED b/c of the violent oppression Rome was putting on Israel…and straight up taking their money in tax form was disgusting – heck, I empathize with those ill feelings. Then, Jesus not only calls on him to be one of his disciples…BUT goes and HANGS OUT with all of his buddies – and must have been doing this more than once – bc Matthew 11 gives mention of him doing it again! Wow…talk about perspective. I keep hearing 1 Samuel 16 echoing in my head when I read this…’man looks on the outward appearance, but God looks on the heart’. Jesus wasn’t concerned with their reputation, their social status, or the view ppl had of them…he was after their hearts. He was after their LIVES…and if HE knew HE could CHANGE their worlds…they would change THE WORLD! The religious church disqualified a guy who wrote the FIRST book of the New Testament…simply b/c he was a TAX COLLECTING SINNER! I love what Matthew calls him in Chapter 11 ‘his friend’. I want to be a FRIEND OF SINNERS! Awesome. I AM LOVING THIS! If you’re behind, that’s cool…just keep going…that’s what matters! Matthew 10. This chapter is pretty wild. Jesus gives (IMO) one of the most DE-MOTIVATIONAL speeches EVER to his disciples before they head off to impact Israel. Sure, he starts off (v. 1-8) with some encouraging stuff…but THEN this ‘locker room speech’ seems to go south with all kinds of dangers and pitfalls to avoid…Jesus starts warning of death, rejection, and imprisonment…in verse 16 he says it will be so dangerous it’s like sending sheep out among WOLVES…in verse 22 he says EVERYONE will HATE THEM…I mean this is not something you’re going to hear many coaches tell their team before a big game. Of course, we know WHY Jesus is being this blunt with them…bc there is an enemy out there that they are about to go and FLAT OUT DESTROY…and this is the battle that will come to them as a result of their efforts…and Jesus wants to keep their minds, decisions, & habits focused in the right direction. What’s crazy, is that they STILL WENT…even with all of the warning. <—-That’s what I want to ensure I’m living out tomorrow…I want to go WHERE he wants me to go regardless of what is out there. MAN! If you compare this teaching with the ‘feel good’ teachings that we get most of the time in churches today…Jesus wouldn’t be such a popular choice to follow. I always say this @ Journey…He never promised rainbows in our lives if we would follow him…in fact, he said there will be tough times simply bc of the enemy we will face in our lives…BUT HE IS WITH US…every STEP of the way. This is my challenge for my tomorrow. Love ya Journey! I did my VERY best attempting to live out today what jumped off of the pages at me when I read this incredible chapter. The chapter opens up with Jesus wrapping up his VERY TOUGH ‘locker room’ speech to his disciples…and then the attention is turned to what’s going on with John the Baptist (ONE OF THE MOST INCREDIBLE DUDES TO EVER WALK THE PLANET) who is in prison. As I was reading this, there was a message that I heard a while back by a pastor name Steven Furtick that kept echoing in my mind. The message was on this particular scene where Steven points out something interstesting that Jesus is doing…that he is talking about JTB…behind his back. Now when we hear that term ‘behind his back’ that usually carries with it a negative tone (i.e. gossip)…which is what most ppl do when speaking about someone when their not present. BUT NOT JESUS…he literally goes on an 11 VERSE RAMPAGE…straight up HONORING HIM! Bragging on him, saying EVERYTHING he loves about him…WHEN HE’S NOT EVEN THERE! That challenged me today…I want to be like Jesus was RIGHT THERE! In other words, what I wanted to do today is LITERALLY HONOR PPL…BEHIND THEIR BACKS! Reading this chapter today is INCREDIBLE! What stuck out to me was right at the tail end of the chapter (verse 46-50). Jesus is OBVIOUSLY pretty busy and in demand…and someone lets him know that his momma (Mary) and brother (James) are outside of the synagogue where he is and wants to speak to him. At first, you’re like…DANG, Jesus…this is your family, and that was a little rude IMO! But, looking at Jesus and his relationship with his mother and brother…he could NOT have meant that in a rude way…b/c he had SERIOUS love for them…and that is seen through his HEAVY commitment to them both as seen throughout the gospels. I believe the point Jesus is making is a BIG ONE. YOU ARE ALL MY FAMILY! Why? BECAUSE I MADE ALL OF YOU! This was one of those ‘don’t put me in your box’ statements that limit Jesus being family-tied to just a few ppl (Mary and James)…we are as much his family as they are. B/C to me…that’s POWERFUL! I want to make others feel that they a part of the family of God as my family is. Tomorrow…look out, I’m going there w/ some ppl to make them feel apart of the family of God. …continuing the Sermon on the Mount (which with the entire chapter being filled with teaching of Christ…there’s SO MUCH that can jump off of the page at you). For me, it’s been a great experience reading The Sermon on the Mount in the Message Version…which gives an incredible perspective on what Jesus is saying. For instance, I love how the Chapter gives light to understanding that God is our ‘Father’…and a ‘Father’ that wants the best for our lives…and that’s so evident in and throughout this teaching…I mean the Lord’s prayer, especially in the Message Version is INCREDIBLE! But what jumped out at me (to challenge my tomorrow) was the first two verses out of the gate of this chapter which read, ” 1 “Be especially careful when you are trying to be good so that you don’t make a performance out of it. It might be good theater, but the God who made you won’t be applauding. 2 When you do something for someone else, don’t call attention to yourself.” What I want to do tomorrow is something that will bless someone incredibly…and they have NO IDEA who did it…nor will they ever…BECAUSE I believe Jesus is trying to get a point across here that OUR service to God is NOT meant to be a spotlight for our name to shine…rather it is meant to LIFT HIS NAME UP. God, lead my steps tomorrow to be a blessing in disguise…and live out YOUR TEACHING in MY LIFE. Just wanted to post my life today in it’s attempt to LIVE OUT some things that jumped off the pages @ me in this HEAVY chapter (in The Message version). As a pastor (or preacher) I was obviously challenged when reading verses 15-20 which says “Be wary of false preachers who smile a lot, dripping with practiced sincerity. Chances are they are out to rip you off some way or other. Don’t be impressed with charisma; look for character. Who preachers are is the main thing, not what they say. A genuine leader will never exploit your emotions or your pocketbook. These diseased trees with their bad apples are going to be chopped down and burned. I don’t feel I struggle with this at all…but it’s always IMPORTANT to see what NOT to be! I sure hope I exemplified that this weekend at Journey as a preacher. 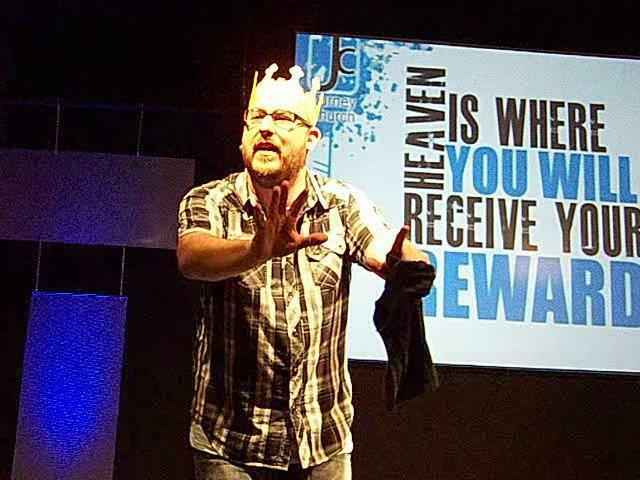 I always want to be living out my life in the way Jesus commands, in my role as a pastor. Going toward the end of the chapter (in the NIV Version)…verses 24-28 are one of the MY FAVORITE parts of the entire bible, talking about the importance of our homes being built on the ROCK (meaning hearing AND living out the teachings of Jesus). It was cool just to read that with my boys tonight and talking about how we can apply that in our lives. Family devotions are so important and an ESSENTIAL command of Jesus seen right here at the end of Chapter 7. We’re 1/4 of the way through Matthew…I am LOVING THIS! Jesus wraps up the Sermon on the Mount and straight up works OVERTIME on miracle duty (i.e. Heals a leper, a centurion’s servant, Peter’s mom-in-law, flat out calms the WIND & WAVES simply by SAYING SO after he and his disciples were about to taken out by a storm on their boat, and ends the chapter by casting several demons out of two men)…WOW! This entire chapter says to me that Jesus was AVAILABLE to the needs of people…I want to walk that path tomorrow as a follower of Jesus. I want to be available to the NEEDS OF PEOPLE…I want to watch GOD use my life to meet needs that weigh heavy on the hearts of those who desperately need a touch of God in their life. Short, but so so sweet to me. God, use my tomorrow in this INCREDIBLE way! (Matthew 1 is in the previous post in video form). Matthew 2…WOW! This chapter, in my opinion just SCREAMS an amazing challenge to my life: When God puts a miracle in our lives…WE HAVE TO PROTECT IT…because there will always be STRATEGIC OPPOSITION from the enemy to try and take it away. You would have thought that when Jesus shows up at the manger…Joseph & Mary’s part in this thing was done…I mean Jesus (GOD) is here now – let’s celebrate – bring on the 3 kings…bring on the wise men with their gits! If there’s trouble down the road, Jesus or the angels can handle it…but look at what kind of opposition Joseph and Mary were facing in verses 13-21 to protect that miracle. There was still responsibility even AFTER the miracle came. And because they listened and obeyed…they experienced victory in verse 23. MAN! I want to protect what God has given me by keeping my ears, eyes, heart, mind, and soul WIDE OPEN to what God wants me to do to PROTECT the miracles God has given me…and what the enemy STILL WANTS to destroy. Matthew 3!!! What jumped off the pages at me were the first 11 verses that seemed to be carrying one theme: REPENT! (and let’s get real, most ppl in our society get a negative religious feel with that word). But, if you you look at it…it was the focus of John The Baptist’s ministry (who was an INCREDIBLE DUDE!) and it was the theme of EVERY message he ever shared (that we know of). I looked it up, and the greek word for ‘repent’ isn’t some hateful, religious word…it literally means ‘to change one’s mind for better’. MEANING, GOD ALWAYS SOMETHING BETTER FOR US! We have to put our LIFE inside of that MINDSET and allow it to change us. It’s interesting that right at the top of the chapter (in my bible at least) there is a ‘title’ to the chapter that says ‘John the Baptist Prepares the Way’…and from verse 1 through 11 you see God using a man who TALKED and WALKED repentance (in it’s true meaning) to PREPARE the way for Jesus to come on to the scene and begin his ministry on the earth…WOW! Today, I’m taking away from this chapter that MY REPENTANCE will ‘prepare the way’ for Jesus to begin doing some INCREDIBLE things in my life. I pray God uses my tomorrow to show this in a John The Baptist kind of way. Matthew 4…there was SO MANY things that stuck out to me in this chapter. I mean, you got the temptation of Christ in the wilderness PACKED with stuff, you got Jesus pulling the first of his disciples, miracles all over the place…this is a heavy chapter! One thing in particular that stuck out to me was it says in the middle of the chapter that John the Baptist (who was one of Jesus’ CLOSEST friends) was put in prison…it says Jesus was so impacted by this news that he withdrew to another city as if to get away…and then even begins honoring JTB by continuing the message of repentance that JTB preached hard leading up to Jesus coming on the scene. Wow, that jumped off the page at me to show me that our relationship with God not only impacts OUR life in a powerful way…but it also impacts HIS life. Jesus is our Lord, but the bible says He’s also a friend what sticks closer than a brother. He cares about us BIGTIME. Whe we go through tough times, He is right there…invested into us emotionally. Anyway, those are my thoughts so far into this incredible book…it’s amazing how God’s Word can come to life IN your life…everyday. COMING THIS WEEKEND @ JOURNEY! I am so READY to begin this series of talks @ Journey! This entire series was inspired by a moment I was having watching the Discovery Channel a several weeks ago. It was a show about the frozen north and south ends of our planet and they did a segment on penguins and the nature of their life – and I gotta tell you – before the show ended, I had a pen and pad with a ton of notes about the similarities we have in our lives with our relationship with God! It was CRAZY! Anyways – this is set to be a very powerful time together @ Journey and we encourage you to experience it with us…you’ll be glad you did. 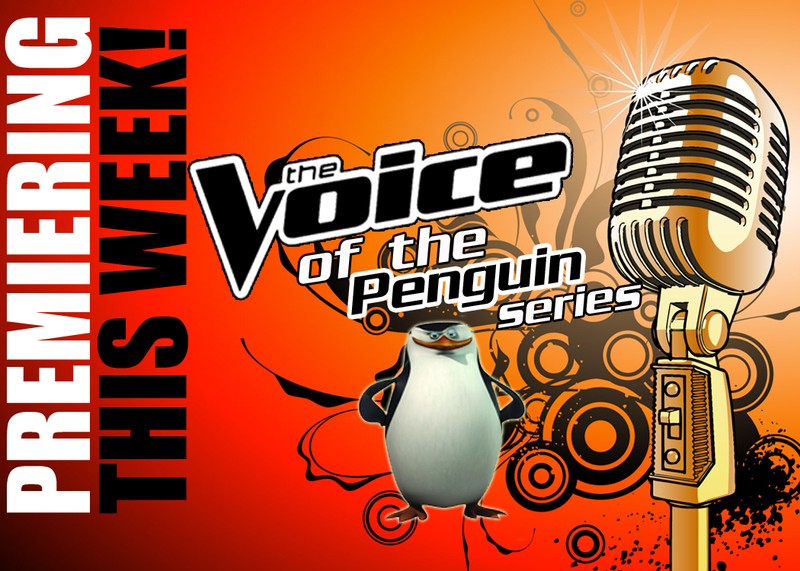 Saturdays @ 5P & Sundays @ 9A & 11A! Back in the youth pastor days of my life – there was a song that we sung literally EVERY week by Chris Tomlin (you know, the modern day father of all worship music) called ‘We Fall Down’ wherein the song attempts to paint a picture of Revelation 4 where humanity sees the amazing glory and power of God’s throne in heaven and all they can do in response to this sight is fall off of the thrones God made for them and worship Him…all humanity can do is take the rewarding crowns that God created to be placed on their heads and toss them before God’s throne…as if to say – GOD, YOU ARE THE DEFINITION OF ROYALTY HERE, not me…YOU DESERVE IT ALL! Wow, I cannot wait to experience Heaven, and the opportunity to do the same as those did in Revelation 4. 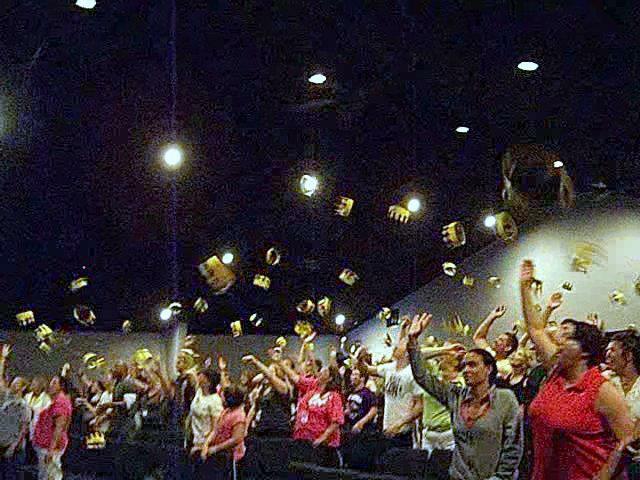 This past Sunday, we talked about that very thing and the best way we could illustrate it was to order 600 Burger King Crowns (BTW – THANK YOU BK!) and toss them in a rehearsal-like mindset to give us a picture of what it will be like on that great day when we finally arrive at Heaven’s Golden Gates!